The name ‘celadon’ derived from two Sanskrit words: ‘sila’, meaning ‘stone’, and ‘dhara’, meaning ‘green’. Therefore, ‘Celadon’ means green stone. Celadon comes in many shades and styles, being found in tones of light and help with writing a thesis dark gray, honey yellow, green and green-yellow, olive green, blue-green and brown. 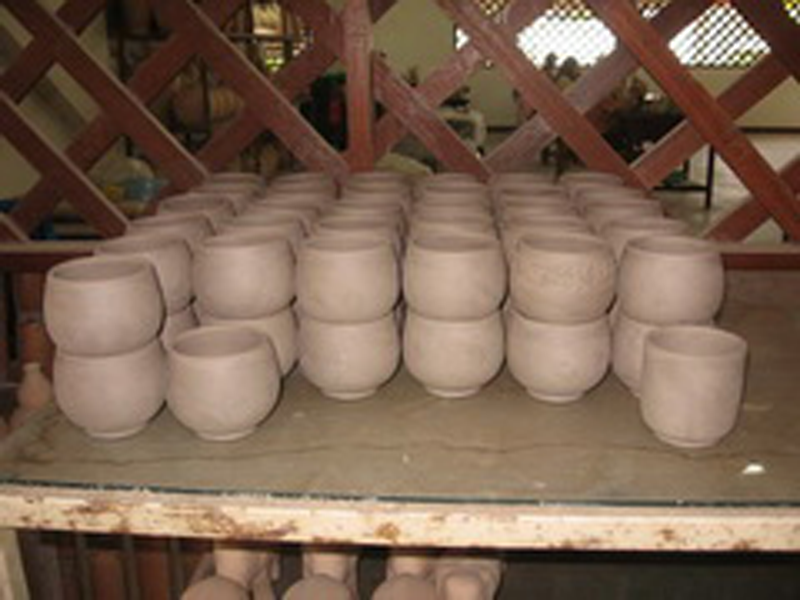 During 1300-1500 A.D., Sukhothai – the capital of the first Thai Kingdom – was the production center of the greenish-glazed stoneware known as “Sangkhaloke” wares due to the mispronunciation of Sawankhaloke – the name of an important production site of the kingdom. In general Westerners call this kind of ceramic “Celadon” after a French term, but in fact Celadon originated in China whose products have always been easily identified with Chinese characters at the bottom of the vessels. But if a vessel bears Thai letters instead, it was certainly made in Thailand. 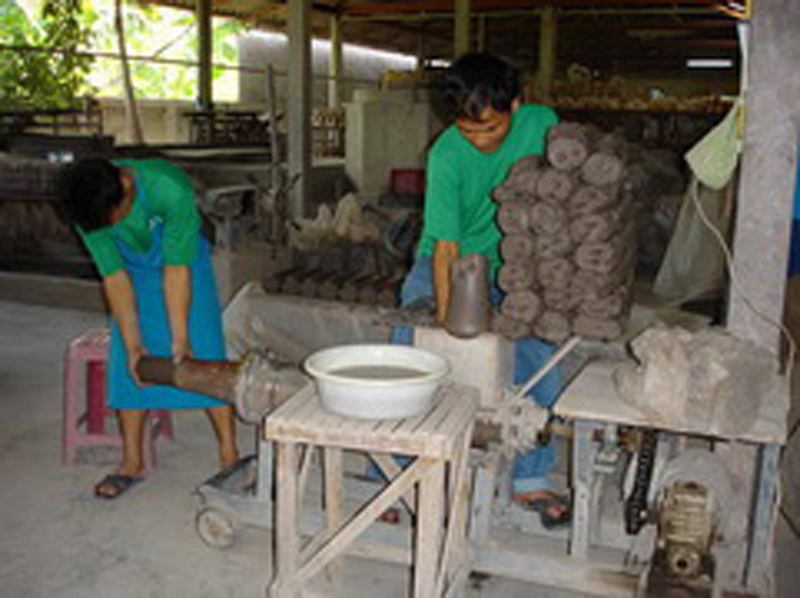 Sukhothai was the center of the continual production of Celadon for over 200 years as evidenced by hundreds of old kilns excavated at Tambon Ban Ko Noi and Tambon Payang in Sawankhaloke. In addition, fine specimens of Thai Celadon have also been found in different countries along the ancient shipping trade route in that era such as Java, Sumatra, Malacca, the Philippines, Japan. At the end of Sukhothai period, the kingdom had been constantly weakened by warfare against the invasions of neighboring kingdoms, which eventually led to the southward-shifting of the capital to Ayutthaya, thus the halt of Celadon production at Sukhothai. 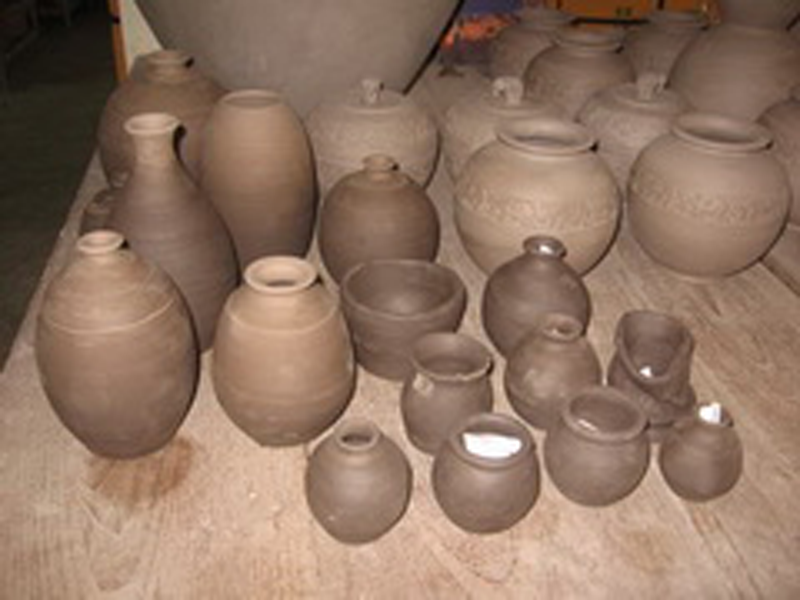 In Chiang Mai, the low-fired earthenware or Terra Cotta, like water containers, pots and vases, has originally long been produced for daily life uses. Later on, in 1950, groups of Shan people migrating from Shan State, Myanmar, founded several wood-fueled kilns near “Chang Peuk” the city’s northern gate, making high-fired vessels glazed with wood ashes. 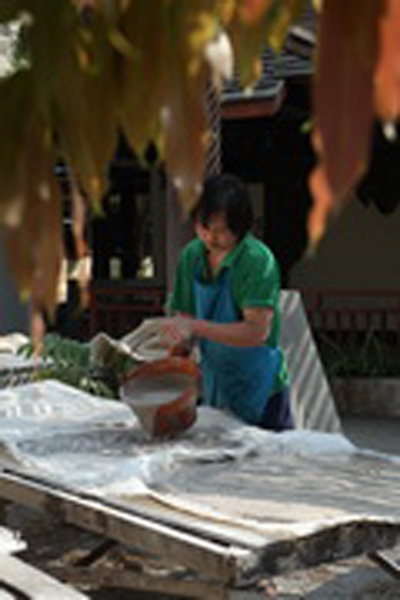 Their products, apparently destined for local markets, such as pots for soaking sticky rice, flower pots, water pots for cabinet stands etc., were all green glaze stoneware or Celadon. Ever since Celadon wares in different forms have been developed to meet all functional needs. And later, when some westerners have participated in this beautiful craftsmanship by operating some celadon factories, a more variety of designs has been produced, such as dinning sets, vases, and decorative items. As a result, Celadon has become increasingly popular, thus encouraging its further and various improvement. 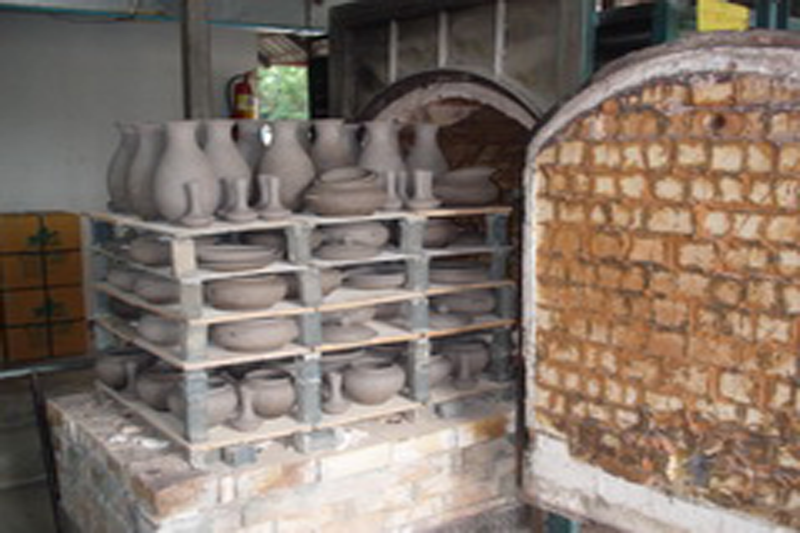 A number of factories in Chiang Mai have become well known, and the majority of them appreciatively maintain the traditional production method with minimum mechanical devices, including using the ancient glaze formula prepared with the ashes of Overcus belutina and Terminalialate heyna. 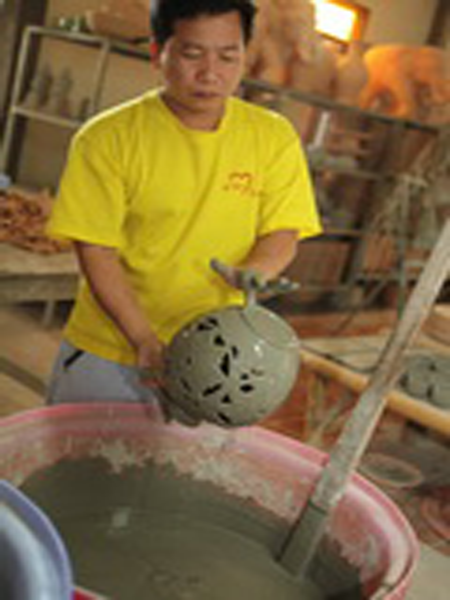 As celadon is a manmade product which depends upon the skills and experience of craftsmen, it is valuable. Because of its attractiveness, celadon is used both for home decoration and everyday use. Cooking and serving with celadon ware is recommended, even in a microwave oven, since no chemicals are used during production. Celadon can be considered as a Thai art and craft which is closely related to Thai culture and tradition from ancient times till nowadays. 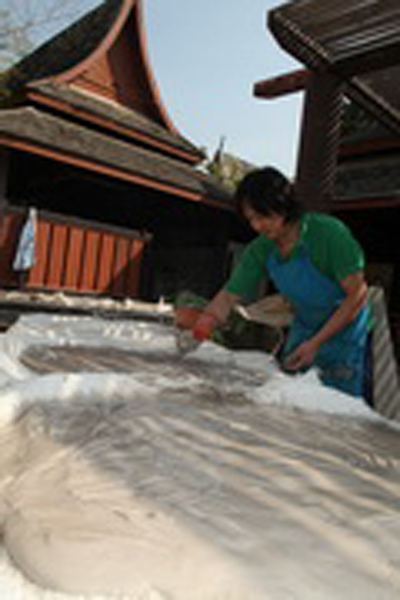 The traditional process from our Thai forefathers and the skills in today’s production constitute a valuable and important heritage for the future generations. Each tool or crafted object has been improved in every possible way during the long period of its use. Celadon reflects the uncomplicated feelings and spirit of the local craftsmen whose imagination and effort are fully utilized in its production. Practical celadon wares consist of items such as cups, plates, bowls, trays and others. Besides celadon for daily use, some celadon products such as a Thai god statue, a symbol of people’s worship to their god, are valued for their spiritual function. The works not only reflect the cultures, traditions, customs and religious beliefs of the makers but also reflect the feeling and state of mind of the craftsmen. Creation of celadon ware needs the skills of craftsmen to judge whether its form and decorative patterns go together and whether it possesses artistic beauty. 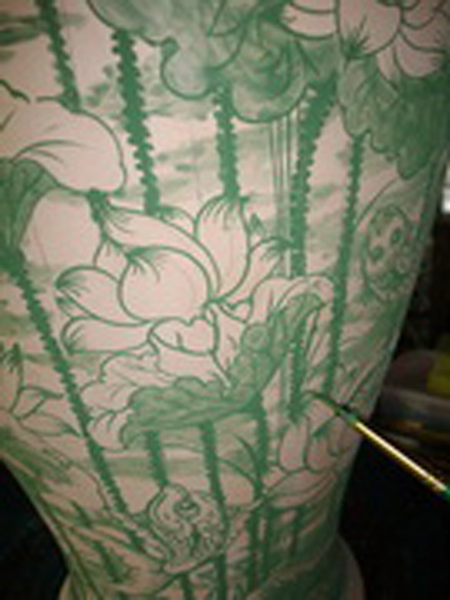 Celadon product is considered as valuable art since only it can show the right combinations and patterns. With an expressive value, some celadon works express the simplicity, firmness of feeling of each craftsman. The tenderness, love of arts and faith of craftsmen are also expressed through their celadon works. 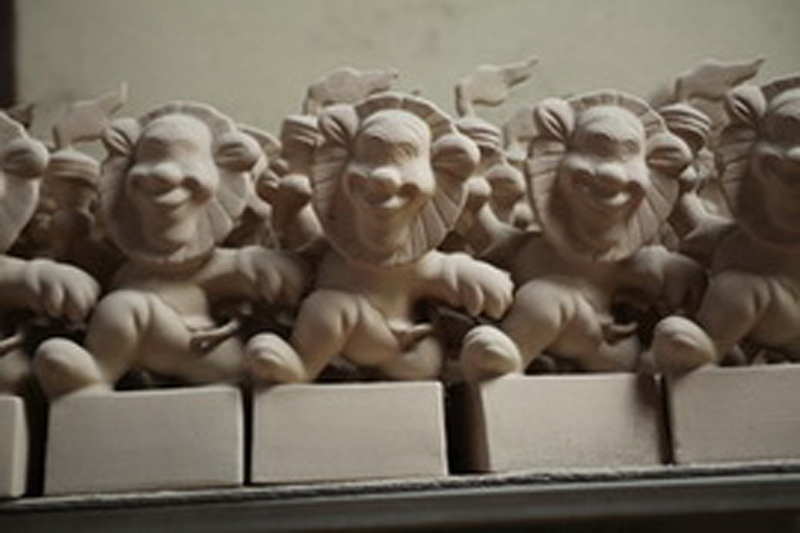 STEP 1: The first step is clay preparation. 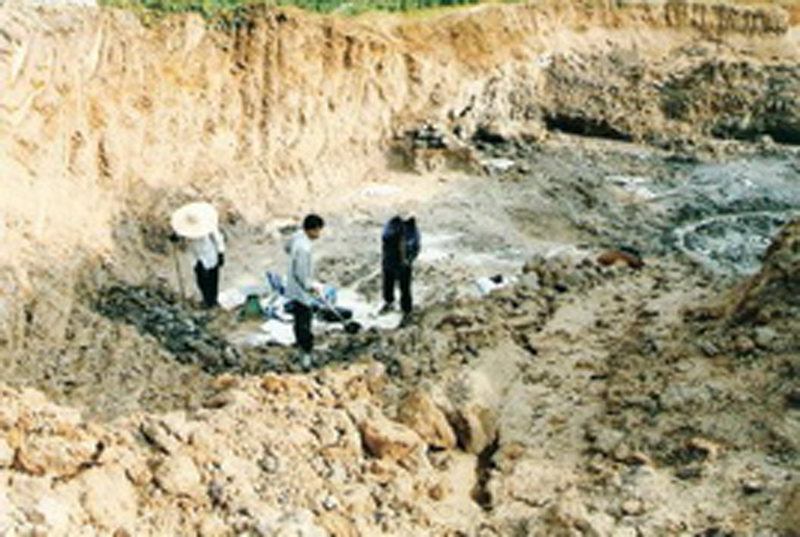 To produce stoneware, black clay know as “din dam”, mostly found in quarries in Chiang Mai, is needed. 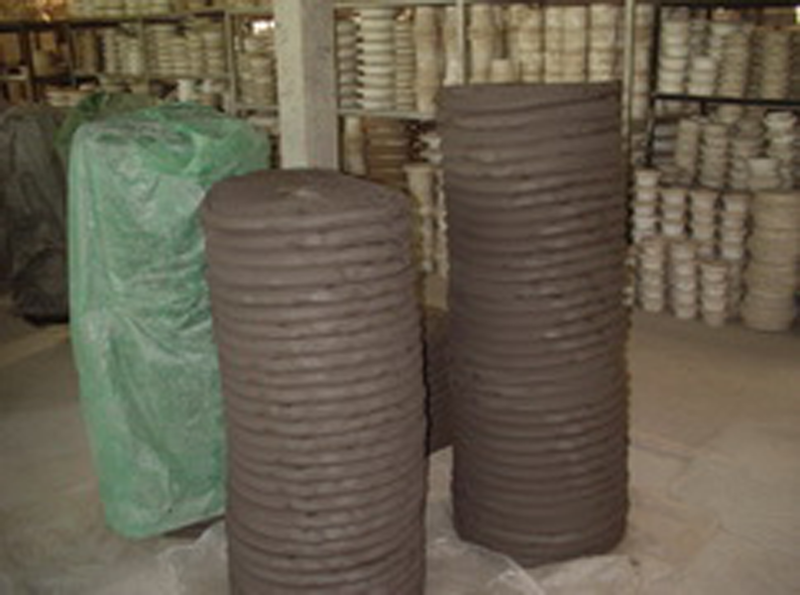 The clay is dried, pounded, grounded, and sieved in order to have really good quality clay. STEP 2: The dried clay powder is mixed with water to clean it from impurities such as iron or any others, then passed through a plug mill to press the water from the clay and made into clay slabs. 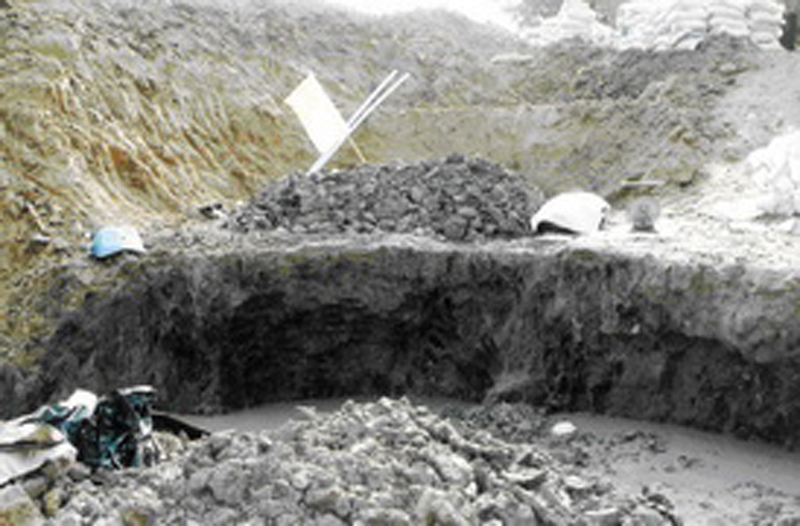 STEP 3: After being compressed in the pug mill, the clay must be left exposed to open air for a while so that organic matters in the clay can congregate. STEP 4: The clay is kneaded to remove air bubbles. 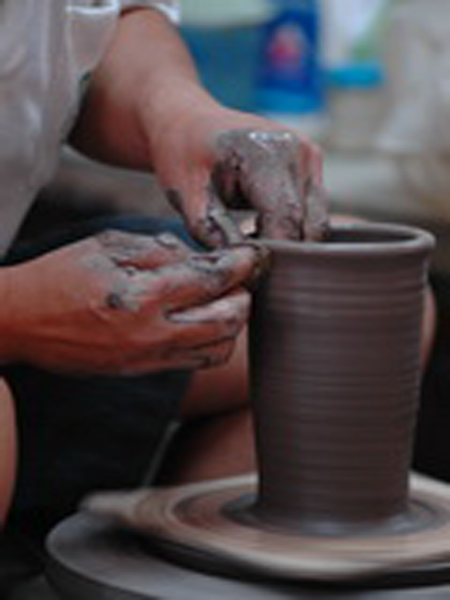 STEP 5: The clay is thrown on the wheel. This process is called “Forming on the wheel”, one of the three forming processes. 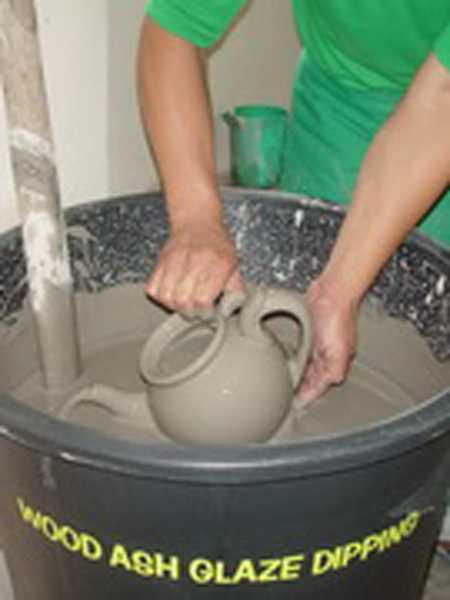 The other forming processes are ‘cast molding’, and forming by ‘jigger’ (rotating the clay under a foaming knife). STEP 6: After being thrown, the products are left to dry naturally in open air. 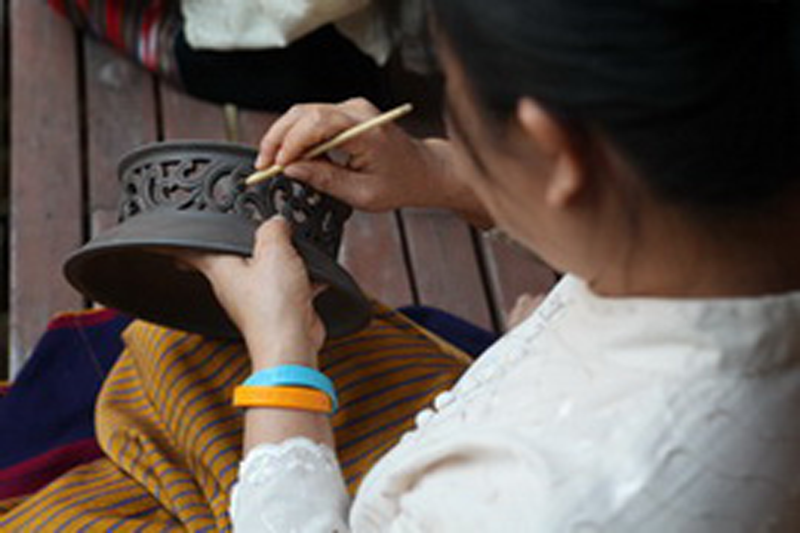 STEP 7: Then the products are hand carved, incised or embellished with elaborated decoration. STEP 8: The next step is biscuit firing. The products are fired at the temperature of 800 degree C for 6-8 hours. The purpose is to harden the clay so that it can be exposed to water. After this biscit fire each piece must be inspected for defects or cracks. STEP 9: After inspection, each piece is painted with more elaborated colors. Then the biscuit products are glazed by dipping into the glaze solution mixed with clay from paddy fields and wood ashes of Overcus belutina and Terminalia alata Heyne. STEP 10: The products are fired at an initial temperature of 1250 degree C, which gradually increased to temperature of 1300 degree C. The total firing lasts 8-10 hours. 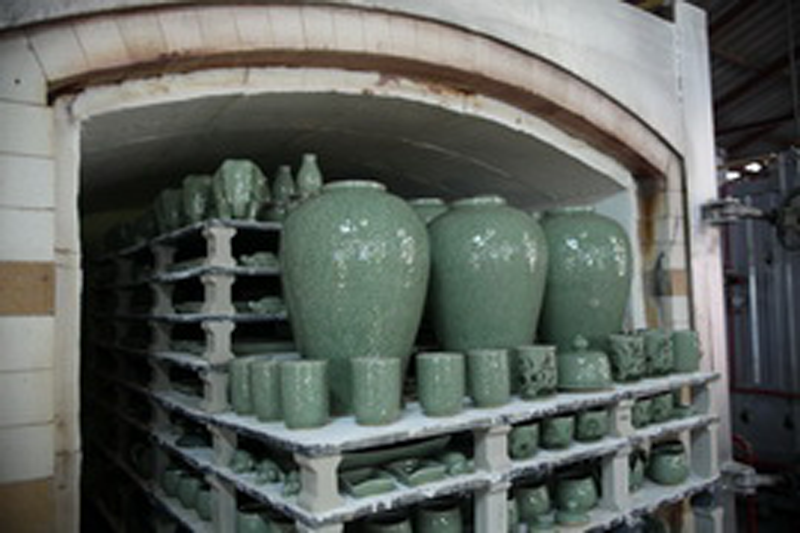 After the products are taken out of the kilns, the cracking begins, giving celadon its distinctive appearance. 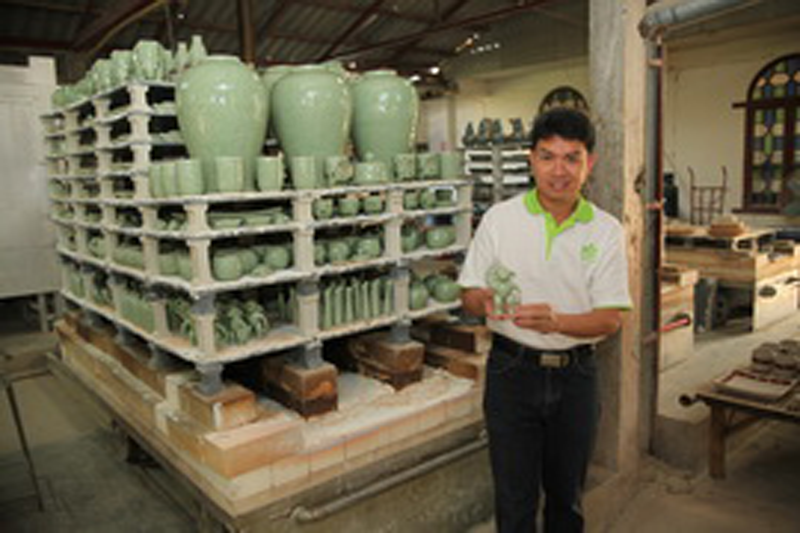 At Baan celadon finishing is the final step in manufacturing the products. All goods are inspected to ensure quality and design are according to our standards. Base ridges are scraped clean of glaze, small imperfections corrected, final touches are added, and goods are hand-polished before packing. Goods destined for our overseas customers are carefully packed so that they arrive undamaged. Our expert packers know how to protect even delicate ceramic products to survive rough handling during shipment. Their record is excellent, with very few products suffering breakage and requiring an insurance claim. All celadonware at Baan Celadon are carefully crafted, generally of simple design with standard patterns and decorations. They are available with smooth or crackle-glaze finishes in our subtle natural celadon shades, achieved in the traditional methods by firing with wood-ash glazes. We have a wide range of these more affordable items for selection for everyday use, as gifts or ornaments. Decoration, food preparation and serving, lighting and atmosphere, surfaces and accessories – there are a multitude of possibilities. They are in a wide variety of styles, types and finishes. All items are available in unique hand-painted or crack-glazed finished in natural colours in greens, blues and earth-tones. Kitchenware items are food-safe, microwave and dishwasher capable. Celadonware’s natural colours, textures and finishes blend perfectly into gardens and outdoor areas. Cool sea-greens, emerald-greens, teal and earth tones, with cracked-glaze or silky smooth finishes. Informal yet classy garden or poolside accessories. Such items as bird baths or fish and lily bowls create a friendly and classic corner of your garden. Celadonware is the perfect material for so many items used in spas and hotels. Its subtle, natural colours and cracked-glaze texture lend a touch of class wherever it is placed. 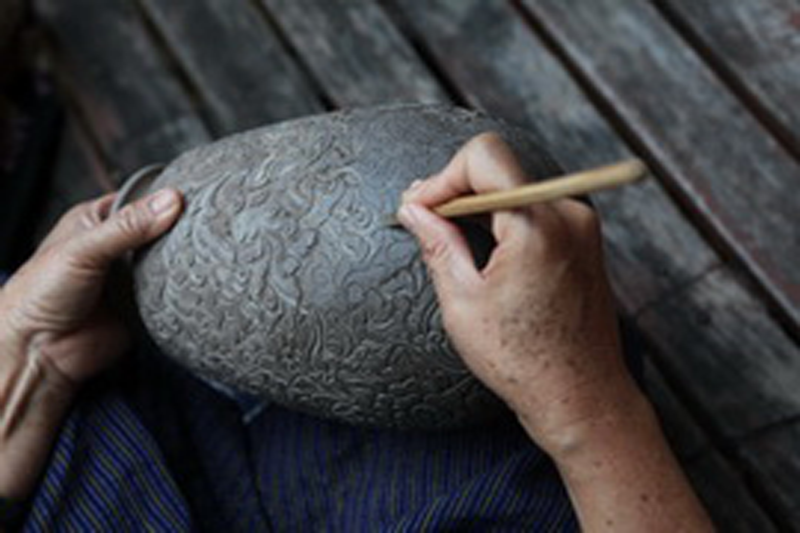 Or specify Baan Celadon’s beautifully hand-painted patterns or designs for a richer appeal. Pamper your guests with relaxing style and quality. Gifts and Incentives of celadon are always appreciated for their intrinsic value, and for the thought behind their selection. Durability and quality means they will be treasured for many years. Add your corporate insignia for a memorable Incentive Item.